This terrible device was used in most of Europe during the Middle Ages. It's a very simple instrument that was used to tear a victim's skin apart. Due to its shape, neither bones nor muscles were spared. The victim was naked and tied making him or her completely defenseless. Then the torturers began the (sometimes public) act of mutilating the victim. They often began with the limbs and slowly moved into the chest, back, neck and finally the face. In short, the Spanish Tickler or Cat's Paw, is nothing but an extension to the torturer's hand. The spikes were sharp enough to tear anything in their path. This instrument was very common in Spain, mostly during the Spanish Inquisition. 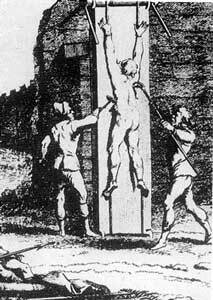 Though its use in France and England is well recorded, they often adopted different torture methods. The Spanish Tickler varied in shape and size. Some were long and had a pole attached to the rear so the torturer could tear the skin from a distance, while others were nothing but the claw itself. Depending on the instrument, the torture varied. This torture often resulted in death, but some victims were spared or convicted to a shorter torture session.